Recently, Bulgari unveiled the 50th anniversary Gerald Genta watch, a timepiece it will be showing this week at Baselworld. I held off on writing about this watch for a host of reasons, but now I am ready to dive into the Gerald Genta 50th Anniversary watch and why it really matters. To begin with, I should preface the article by saying that I knew Gerald Genta, one of the most famous watch designers of all time. He was passionate about his work and especially about his own eponymous brand that he founded in 1969. I would sit with him every chance I got — and annually at the Basel Fair back a few decades ago — and talk about design, and watches, and time. His enthusiasm was infectious. I remember even being a little bit sad when Bulgari bought the Genta (and Danial Roth) brand back in 2000. I was sad that it would be the end of an era. However, even though Bulgari stopped producing the watches with the Genta name on them, the brand brought all of the watchmaking know-how from the brand in house — and quickly started to digest and absorb the horological knowledge behind the brand. Little by little, we have witnessed concepts emerging from Bulgari that had roots in Genta (or Roth). 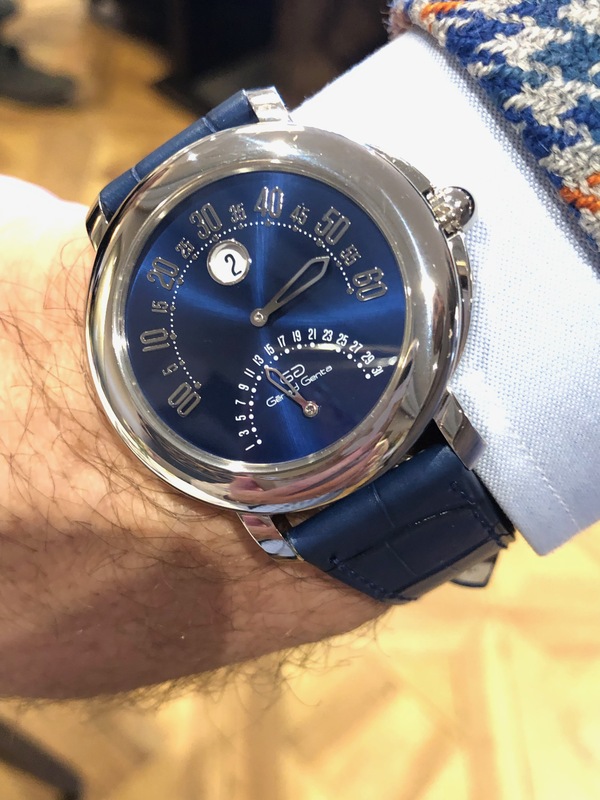 This year, though, Bulgari paid Genta (who passed away in 2011) the ultimate tribute: creating the 50th anniversary watch in his honor and putting the Genta name and logo on the dial. The 41mm Arena Bi-retrograde 50th Anniversary Gerald Genta watch is 41mm in diameter and crafted in platinum. Crafted in platinum, the new Gerald Genta 50thAnniversary watch is in the Arena case and features a shimmering blue lacquer dial. Powered by the manufacture mechanical movement, BVL 300 with bidirectional automatic winding, the timepiece offers jumping hours in an aperture at 12 o’clock, retrograde minutes in an arc from 9 o’clock to 3 o’clock, and retrograde date in a smaller arc above 6 o’clock. It is only fitting that Bulgari turn to this complication for the watch, as Gerald Genta is credited with really putting jump hour watches on the proverbial map. 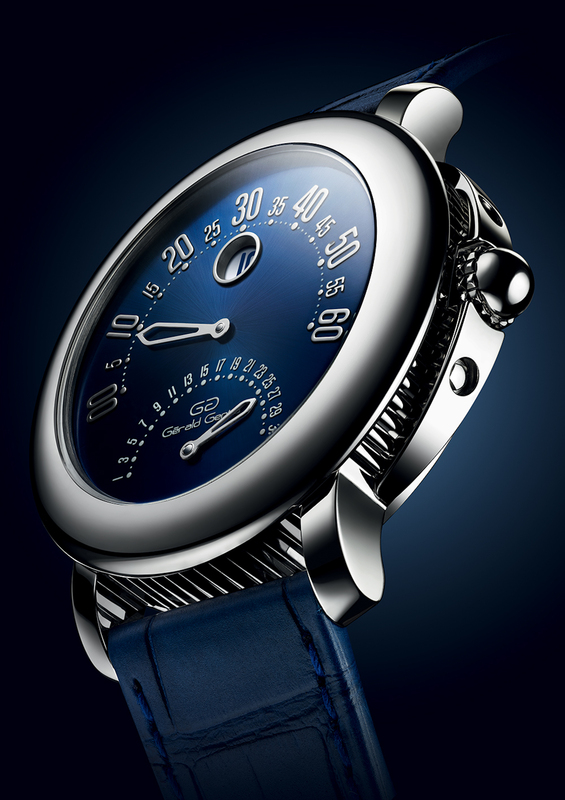 The 41mm platinum watch is finished with a blue alligator satrap and platinum clasp. 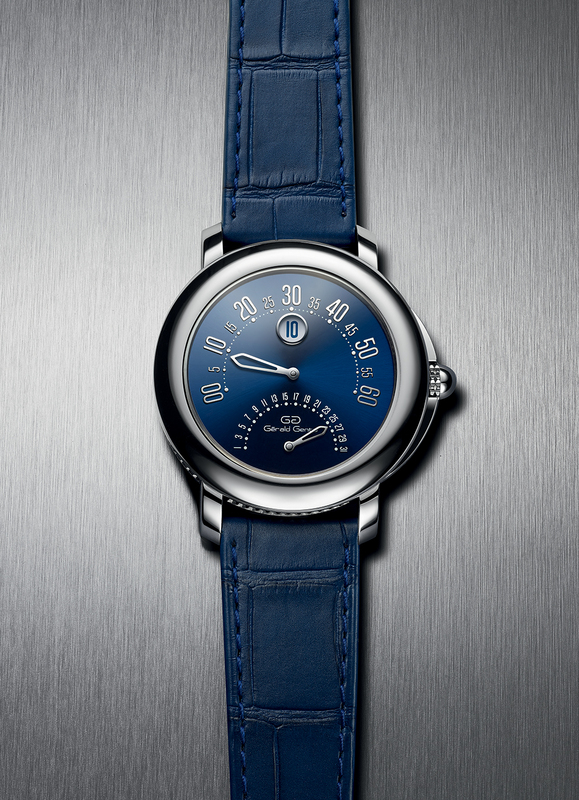 The movement can be viewed via the transparent sapphire case back. 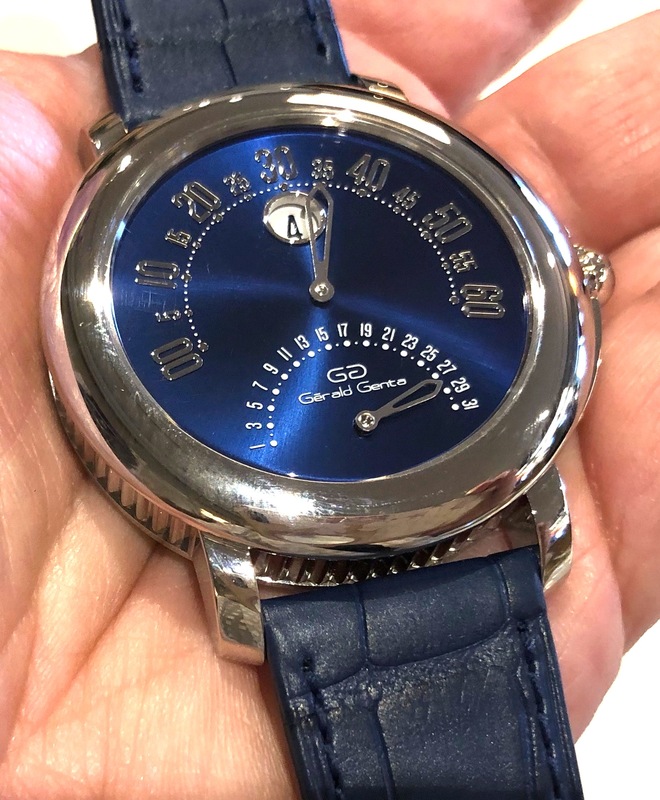 GERALD GENTA 50TH ANNIVERSARY – ARENA BI-RETRO Manufacture mechanical movement Bi-retro BVL 300 Caliber with automatic winding (bidirectional), Jumping hours, retrograde minutes (210°) and date (180°).41mm platinum case, blue lacquered dial, blue alligator strap with platinum folding clasp.